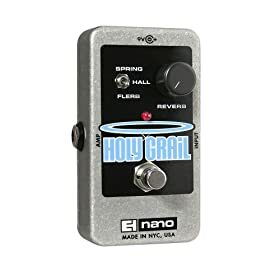 Amazon is having a good deal on the Electro-Harmonix Holy Grail Nano Reverb pedal. Normally, this pedal lists for $158. Musician’s Friend has it for $118.50 + shipping, but Amazon has it for $83.15 + $5.50 for shipping. Not a bad deal. The EH Holy Grail Nano reverb pedal provides the original classic Spring reverb revered by guitarists for its authentic sound, a Hall reverb specifically designed for performing musicians, and the completely original “Flerb” a flanged reverb with unique and haunting spatial definition. The original Holy Grail was prized for re-creating quality reverb spaces and the Electro-Harmonix Holy Grail Nano pedal delivers the same definitive reverbs while saving you pedalboard space. Found another sweet clip from gearmandude (my fav!) — no cowboy boot?? Also nice subliminal message of what he thinks of reverbs in general. i’d rather have a regular EHX Holy Grail than a Nano. .-= less_cunning´s last blog ..less_cunning: Tabasco Chipotle Smoked tastes like ketchup but i am not saying it couldn’t be used as a decent marinade. =-. Curious why you’d prefer the reg over the nano? Smaller footprint is nice.